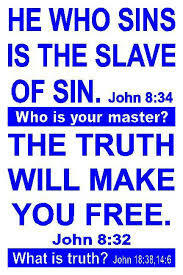 True freedom comes from knowing the truth in scripture (John 8:32). Those in the world claim freedom in life is a life absent of God. Consider this perspective. If your life is focused solely on earth you limit yourself to this physical life, the inconsistency that surrounds you, a life born in chaos. If we relegate ourselves to this life alone, there is no hope and no assurance of survival. Everything is bound to this existence, everything is tenuous. One cannot know when they will die. Life exists only to exist. Each individual must vie for themselves. This truly becomes a world that thrives on survival of the fittest. Everyone without Christ in their life has no future to consider outside this confused, torn and unsatisfying life. Freedom comes from fearlessness. Consider the depth of Revelation 21:8 which begins, “But the fearful…” and ends, “shall have their place in the lake which burneth with fire and brimstone: which is the second death.” Those are individuals fearful of the world, fearful of God and the things of God, fearful to face their own iniquities and seek reconciliation and redemption from them, fearful of all things. These people cower at the thought of any question of their personal character, they want no debate, they are content where they are spiritual in a soup of ambiguity. They fear death, they fear all things in life that can bring about death. They have no freedom, but are shackled to this life. They do not know real terror because when this life ends, they will face a terrifying judgment from an all powerful God. Then, as King Belshazzar did in Daniel 5:6, they will loose control of themselves in horror as they realize their arrogance in the face of the King of the Universe. True freedom is a desire to live outside ones self. To live on the grand plane God’s Kingdom, His Majesty, honor, glory and power at our disposal as we seek to worship him through His Son.This is freedom. We see a future existence in a place of perfect harmony, perfect existence. What is the truth that sets man free? Knowing that on the other side of death is not a dreaded unknowable existence. One does not have to wonder if there is life after death, what that life entails or where it will be lived out. Freedom from this world is provided in knowing God loves us enough to send His Son to die for us, providing us a mansion in a perfect Heavenly Kingdom. Freedom lies in the existence of the Son. Freedom is not in this life, but rests in another existence all together with an individual whom has experienced both this and the other eternal life. Freedom is in Christ Jesus.